This “no stone left unturned” approach means our clients gain a fully-managed, security analyst-delivered service that defends against zero-day attacks and advanced persistent threats 24 hours a day, 7 days a week. LMNTRIX Adaptive Threat Response provides three subscription levels so you can appropriately supplement your team’s skills and risk tolerance. The MSS model was conceived in the late 90’s and not much has changed since then in the way MSSP’s manage and monitor customer networks. During this same time period, the way attackers work to target, compromise, and exploit organizations has changed significantly – in favor of the adversary. LMNTRIX was borne as a necessity to help close the gap left in the market from the traditional MSSP model. 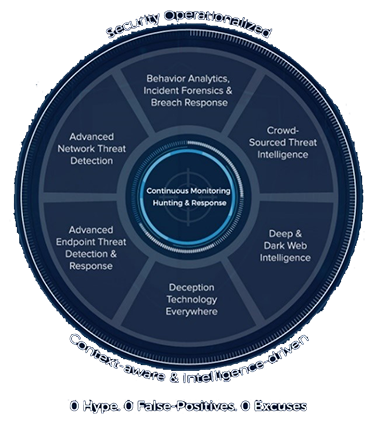 The LMNTRIX Adaptive Threat Response validated architecture was developed specifically to complement an organization’s existing defenses and enable a comprehensive adaptive security protection architecture as prescribed by Gartner. DetectionGuard.com is a division of Virtual Graffiti Inc, an authorized LMNTRIX reseller.